TIME: Are Library Users Happier People? 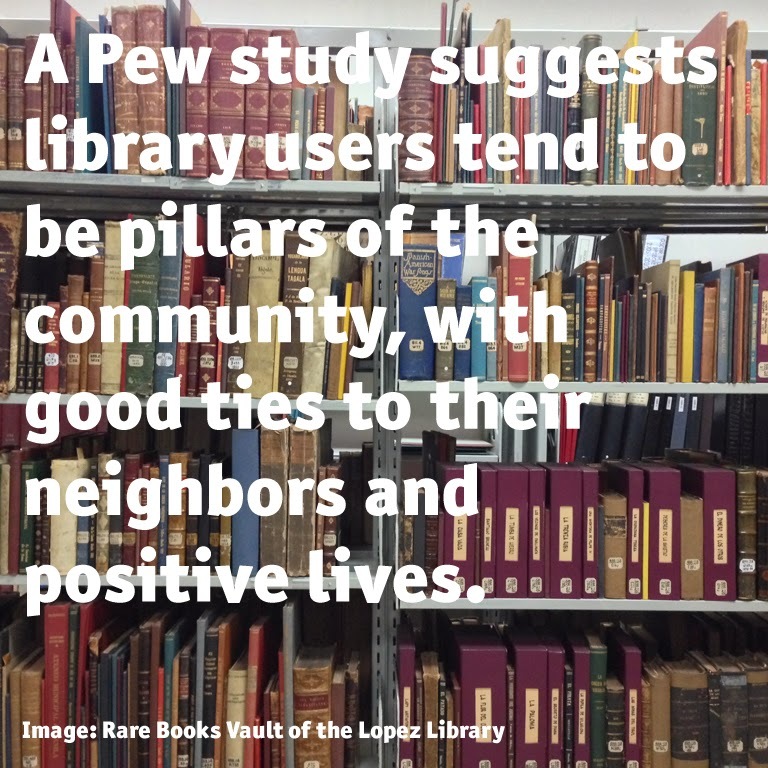 A Pew study out Thursday suggests library users tend to be pillars of the community, with good ties to their neighbors and positive lives. While the study does not purport to measure personal happiness, there’s a significant crossover between the traits of library users and traits of people who demonstrate higher levels of personal happiness: a sense of connectedness and empowerment in one’s community. Library users “are also more likely to say that they like their communities and that they would call their communities good or excellent places to live,” Pew Research Associate Kathryn Zickuhr told TIME. Technology users are generally library users: A common narrative is that Americans are turning away from libraries because of newer technology, but the data shows that most highly-engaged library users are also big technology users. There are some indications that the most plugged-in and highest-income respondents, called “Information Omnivores,” are not as reliant on libraries as the most engaged group, or “Library Lovers.” Still, both groups are highly engaged with public libraries and are the most avid supporters of the idea that libraries make communities better. Image Meme: Rare Books in the Vault of the Lopez Library. For research inquiries at the Lopez Library please call 6312425. Lopez Museum & Library TIME: Are Library Users Happier People?